London maintains its position as the most popular destination since 2013, followed by Johannesburg in second, Dubai in third and New York in fourth. Destinations like London and Dubai are naturally ever-popular among Nigerians as it is easy for them to get visas to these destinations. While destinations like New York is popular, a number of people appear to have been booking flights to Houston and Atlanta. Other top choices include Abu Dhabi, France, China and Istanbul. 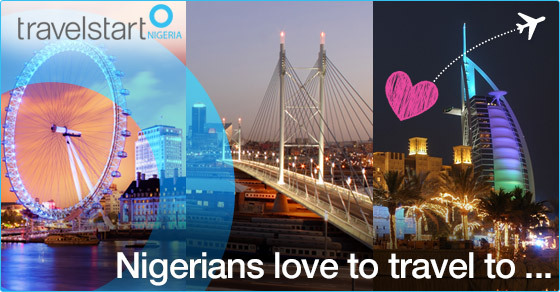 “Nigerian travellers favourite destinations are the most popular due to sheer volume of flight bookings. London is a destination most Nigerian travellers visit mostly, for any vacation trip and the city itself is a popular attraction for families and couples; it is also a hub for travellers heading to other destinations outside the United Kingdom." said Lilian Obinna-Igwe, Country Manager. “Apart from hosting an array of sporting events every now and then, London offers visitors the best big city experiences” According to London and Partners. Similarly, Dubai has become a tourist haven for Nigerian celebrities, as some of them have made this city their wedding venue and honeymoon destination. Dubai continues to lure Nigerian travellers with its promise of luxury, glamourous attractions and first-class restaurants. The fluctuations in currency exchange between Nigeria and other countries make travel to these destinations expensive; despite this, destinations like London, Dubai, South Africa and New York are popular. Johannesburg and Dubai’s warm weather has probably led many Nigerians to visit the destinations. Nigerians have their favourite destination, which undoubtedly is London and that doesn’t seem to change every year.